Should Governments Try to Make Us Happy? Recent reports expose cracks in Bhutan's strategy of promoting contentment, not income. When a Guardian journalist visited Bhutan recently, the country’s “mystical” quotient did not disappoint. Among other things, the writer noted “men and women laboring in song,” a woman “scampering around churning a pot of yak butter tea,” and the “sound of mule bells ringing in the valley.” As he reaches the remote mountain home of a local herder, the man quips, as though starring in a tourism commercial, "You know, happiness is a place." Indeed, it’s a rare Bhutan story that doesn’t mention how irrepressibly joyous the country is. The recently released 2013 UN World Happiness Report devotes a sizable section to Bhutan, attempting to quantify the happiness levels of the only country that prioritizes contentment over income. “We know that true abiding happiness cannot exist while others suffer, and comes only from serving others, living in harmony with nature, and realizing our innate wisdom and the true and brilliant nature of our own minds,” the prime minister said in 2008. Culture is not only viewed as a resource for establishing identity but also for cushioning Bhutan from some of the negative impacts of modernization and thereby enriching Bhutan spiritually. The diversity of the culture is manifested in forms of language, traditional arts and crafts, festivals, events, ceremonies, drama, music, dress and etiquette and more importantly the spiritual values that people share. “Bhutan is on to something path breaking and deeply insightful,” they write. And despite the intensive focus on merriment, Bhutan isn’t as happy as most European countries surveyed in the report (they’re the happiest in the world), though it is happier than its neighbors, Nepal, China and Bangladesh. This fits with existing research showing that richer, better-educated people are happier, in every country, regardless of whether it installs cheery road signs or ensures its people have access to the right ceremonial garb. Now, even Bhutan is beginning to acknowledge that simply emphasizing happiness doesn’t translate to people living better lives. As Bhutan has progressed from a hermetic kingdom to a more developed nation, it has seen a rise in other symptoms of modernity, as well—drugs, gangs, and unemployment. With that has come an increase in mental illness, as the Toronto Star reported earlier this week, which is treated by the country’s sole psychiatrist. “Liver disease caused by alcoholism has become Bhutan’s number one killer,” the Star writes, and many young Bhutanese are hooked on painkillers. The authors of the Happiness Report also found that although most Bhutanese enjoy “sufficiency” in domains like value, safety, languages, family, and urbanization, less than half of Bhutanese have sufficient “literacy, housing, donations, work, services, schooling, cultural participation, and knowledge.” A quarter of Bhutanese live in poverty, and 70 percent lack electricity. 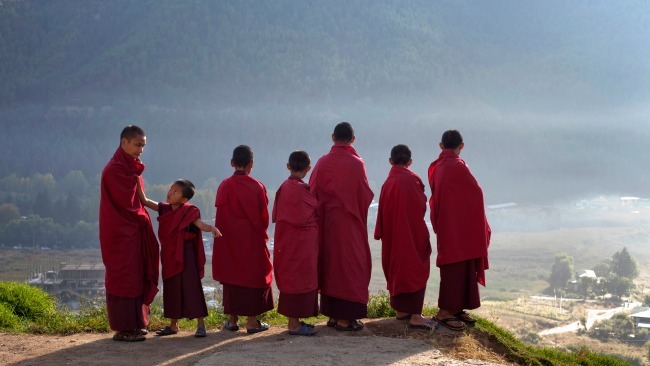 Perhaps because of these shortcomings, Bhutan seems to be pivoting away from GNH and toward more traditional measures of success, like incomes and education. Does this mean Bhutan should just count up cash rather than good vibes? Maybe not. But in a way, many of Bhutan’s GNH measures, like health or “knowledge,” would improve as the country gets richer and develops better infrastructure, anyway. Tracking happiness alongside income makes sense, especially if it helps expose inequalities that might be masked by an overall growing GDP. But it seems that in Bhutan’s case, the problem is that the metric became more of a PR campaign than a development strategy.